Kaohsiung, Taiwan. 5th December 2017. Industrial LCD manufacturer KOE have announced the introduction of a new high resolution 6.4-inch TFT display module. The TX16D201VM0BAB features XGA (1024 x 768 pixels) resolution, a 4:3 wide aspect ratio and IPS (in-plane switching) technology. The 6.4-inch LTPS (low temperature poly-silicon) TFT features IPS wide viewing angle technology which ensures exceptional colour saturation and image consistency over 170° vertical and horizontal viewing angles. A contrast ratio of 800:1 and a brightness specification of 1400 cd/m² ensure excellent optical performance and bright, concise display images. The white LED backlight has a half brightness lifetime of 70K hours. Jason Tsai, marketing manager, KOE said, "We believe that with the new 6.4-inch XGA display, designed specifically for the needs of consumer and industrial applications, KOE is continuing to support market demand for high quality, high resolution displays. Featuring the latest IPS technology enhancements, highly accurate representation of image detail such as colour gradients and authentic colour reproduction is guaranteed. These display attributes are particularly important in multimedia, medical and security imaging applications." The 6.4-inch display features mechanical outline dimensions of 153.0mm (w) x 118.0mm (h) x 8.7mm (d) and an active display area of 129.792mm (w) x 97.344mm (h). The 6.4" display module has the same mechanical outline dimensions as the existing KOE 6.5-inch VGA TX17D02VM2CAA display module. The comparison in resolution between the 6.5" VGA (640 x 480) display and the 6.4" XGA (1024 x 768) display enables the pixel density of the new display to increase from 123ppi to 200ppi (pixels per inch). A single channel 20-pin LVDS interface supports 8-bit RGB and enables a colour palette of up to 16.7M colours. The 6.4-inch display has an operating and storage temperature range of -30°C to +80°C. The display module weighs 170g. Typical applications for the new 6.4-inch TFT display include multimedia monitors, medical imaging systems, security monitors, portable test and measurement equipment. 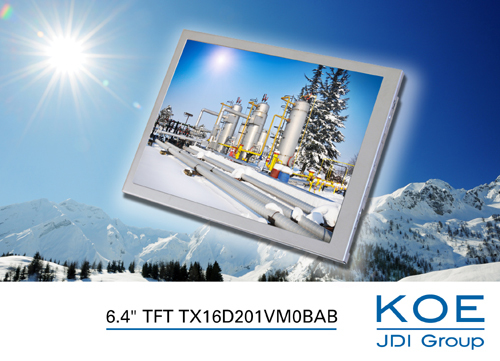 The new TX16D201VM0BAB TFT display module is supplied through KOE's sales channel distribution partners and is available immediately.